The 2019 edition of the IAC Rule Book is now available to members at: https://www.iac.org/download-contest-rules. A summary of all of the 2019 Approved Rules Proposals can be found at the bottom of the Contest Rules page. A working group, appointed by the IAC Executive Committee to *incorporate the Rule Proposals that were approved at the November 2018 Fall Board meeting, has now completed their work in a little under three weeks. At a teleconference today, a majority of the IAC Board of Directors met to discuss the U.S. National Aerobatic Championships and a future location. At the Fall Board meeting in November 2018, the Board had tasked Bob Freeman with researching potential locations for Nationals using the center of the United States as a starting point and at today's teleconference, Bob made a presentation of his research findings. New IAC Web Store coming in February! We are in another phase of our transition to the new IAC Web Store. In preparation, the majority of IAC merchandise has been shipped to Promotional Designs, Inc. (PDI) to take over warehousing and fulfillment. 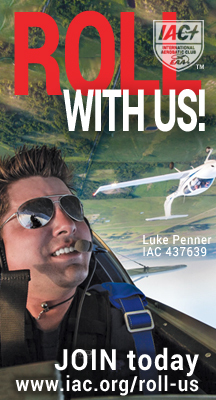 For the next two weeks IAC merchandise that is available on the EAA Shop will be limited. Expect an announcement the first week of February for the new IAC Web Store launch! The final scores have been tabulated for the 2018 regional series competition. Fifty-seven (57) pilots successfully competed at three or more contests needed to qualify for the series and place in the top three in their category for their respective region. NOTE: The figures themselves are unchanged.